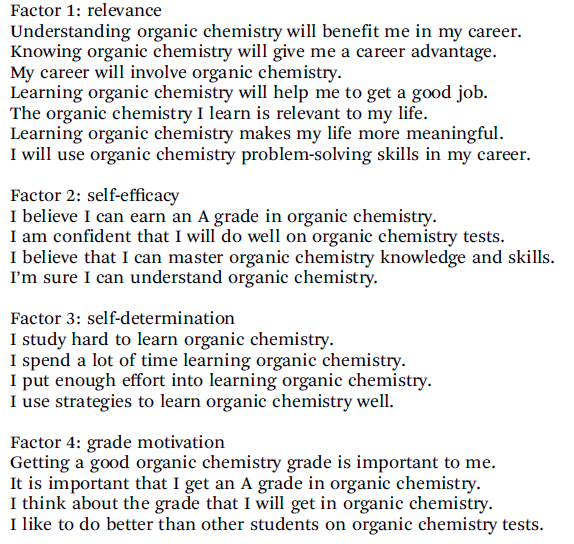 What Motivates the Top-Scoring Students in Organic Chemistry? Is it getting the best grade? Nope. Is it feeling like organic chemistry is relevant to your career? Try again. Is it feeling like you worked hard and prepared well? Surprisingly, no again. The students who perform the best on organic chemistry are most motivated by a high confidence that they can and will succeed in organic chemistry (a principle generally called self-efficacy). From an article published this year in the Royal Society of Chemistry, 2648 college organic chemistry students were given a survey, and their answers were correlated with their organic chemistry scores. The survey consisted of 19 questions, which were split into 4 general motivational categories– relevance (eg, “My career will involve organic chemistry”), self-determination (eg, “I study hard to learn organic chemistry”), self-efficacy (eg, “I am confident I will do well on organic chemistry tests”), and grade motivation (eg, “Getting a good organic chemistry grade is important to me”). The full survey is shown at the very end of the article. 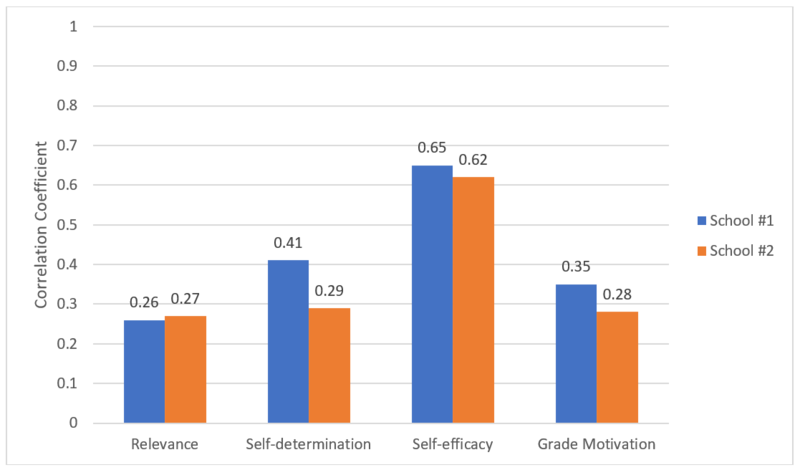 The results show that self-efficacy was most highly correlated with score in organic chemistry (correlation scores of 0.65 and 0.62 at 2 colleges). Therefore, the critical factor that motivates the highest scoring students is a simple belief that they can indeed get an A. Simply put, if you are highly confident you can learn organic chemistry, you are more likely to do better in the course. The second highest correlated factor was self-determination, which is an indication of hard work and preparedness (correlation scores of 0.41 and 0.29 at 2 different schools). Look how much lower the correlation is between this and self-efficacy! The highest correlation with organic chemistry grade is self-efficacy (essentially self-confidence that you can learn organic chemistry). This suggests that being confident in your ability to crush organic chemistry is more important than feeling like you study hard and prepare diligently. Confidence is everything! This was by far the highest correlated factor that the study authors looked at. Students always say, “It’s stupid I have to take organic chemistry—it has nothing to do with medicine.” But guess what? To do well in organic chemistry, you don’t need to feel like it’s relevant to your future field at all! Because the top scorers in your class certainly don’t. Grade motivation was low! Interestingly, students across the board in this study said that they were highly motivated to get good grades. However, this was not correlated with organic chemistry scores. Put another way, the students who were doing poorly were just as motivated to do well as students who actually did well. Many students feel that this is their major source of motivation, so it’s important to know that this doesn’t correlate well with success in the course (AKA: find another source of motivation). Confidence is key in organic chemistry. If you don’t believe that you are capable of learning this tough subject, then the cards are already stacked against you. Austin AC, Hammond NB, Barrows N, Gould DL, Gould IR. Relating motivation and student outcomes in general organic chemistry. Chem. Educ. Res. Pract. 2018, 19, 331.
https://orgomadesimple.com/wp-content/uploads/2016/04/New_logo-1-300x175.png 0 0 ruge@bc.edu https://orgomadesimple.com/wp-content/uploads/2016/04/New_logo-1-300x175.png ruge@bc.edu2018-08-02 22:49:502018-08-02 22:50:11What Motivates the Top-Scoring Students in Organic Chemistry?